Our first destination of the day was the village of Winter Lata, 30 kms from Auli on the road that leads to the Chinese border. In this region, every village is split in two. A set of houses are located high up in the mountains where the villagers farm terraced plots of land for beans, rajma, potatoes and vegetables. This part of the village is inhabited during the summers and monsoons – the growing season in the Himalayas. After Diwali, which comes right after harvest season, villagers pack up their essentials and move to another set of houses closer to the road below. This is where they wait out the winters and the snow takes over the higher village. 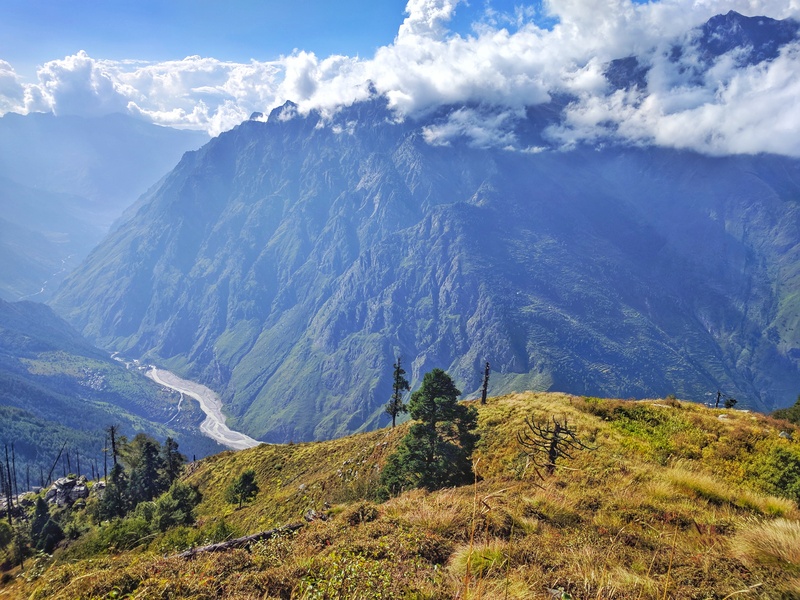 After we climbed down from Gorson, we took a small break at Auli, before continuing to the village of Lata, located about 40 kms from Auli, on the road to Malari (Map with directions). Where we actually stopped was the village of Winter Lata , which comprises of a series of houses on the right side of the road. To the left of the road is a small drop, a couple of levels of terraced fields and then the Dhauliganga river. 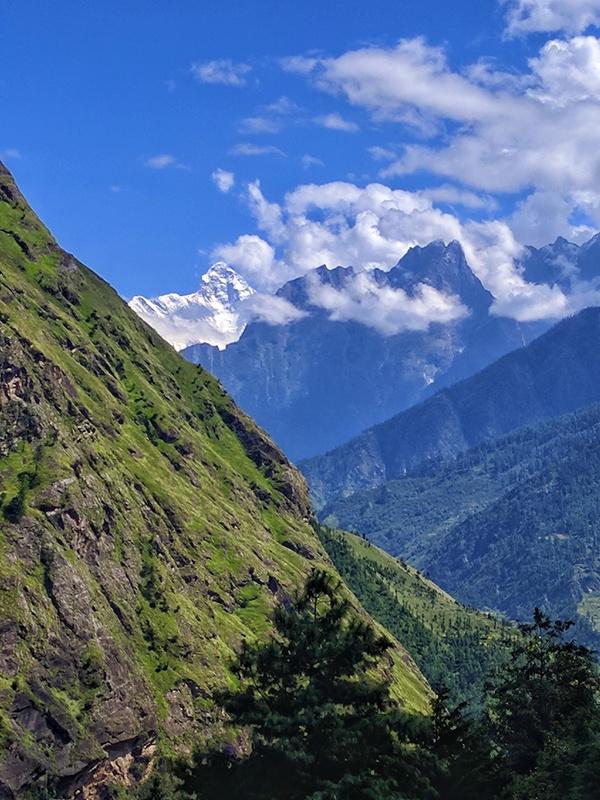 A zoomed in shot of Nanda Devi from Dhak, on the way to Lata. IMPORTANT: The Nanda Devi Outer Sanctuary (NDOS) is a restricted area, even for resident Indians. Entry into NDOS is restricted to 5 people per day and not more than 20 persons per week. For the permit, you will need to furnish one photograph along with a copy of a government issued photo identity card as such PAN Card, Voters’ Card, Driving Licence, Aadhar Card, etc. The entry fee per person is Rs 150 and on top of that, you will need to pay a trail management fee. You will also need to pay for your guide and porters. If you go with a local guide, he can get the necessary paperwork done for you in advance. 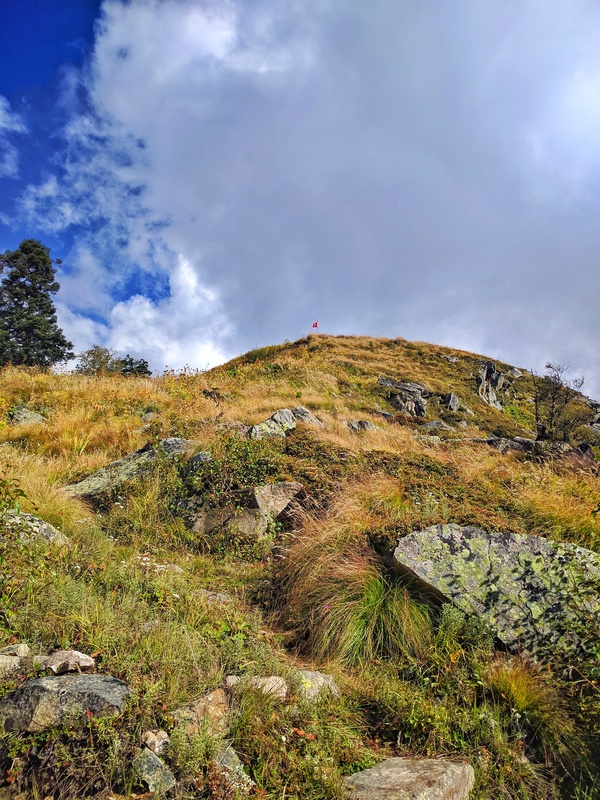 The trek starts from the edge of the road in the winter Lata village, at an altitude of 2,200 m, following a concrete pathway that leads to the Summer Lata village (2400m). 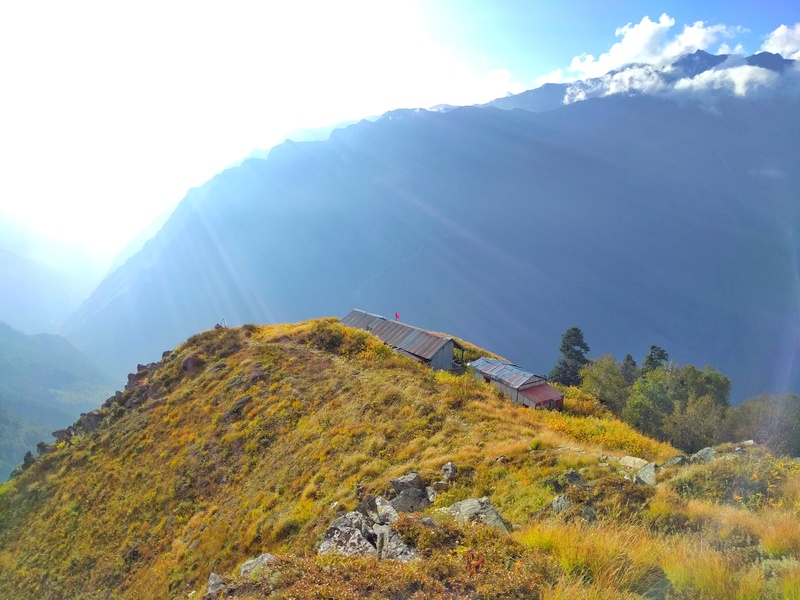 The Ultimate destination was the log huts at Lata Khadak at 3,800 m, almost 13 kms away. The trek is doable in one day if one starts from the road at dawn. But since we were camping the previous night at Gorson, by the time we left the roadhead, it was around 3 in the afternoon. Looking down at the road and the Dhauliganga river. Stepping into the otherworldly beauty of the Nanda Devi National Park. On the left in the gorge cut by the Dhauliganga river. 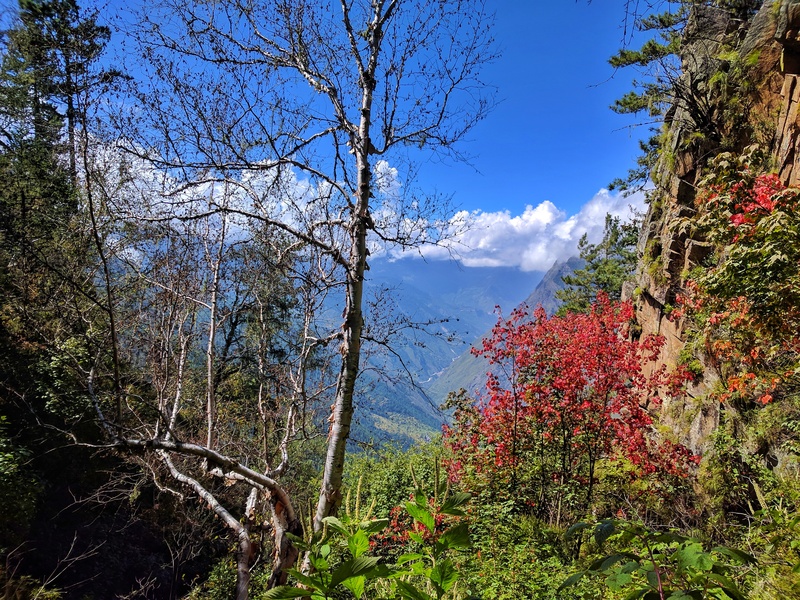 Bhelta: Deep inside the forest, this campsite comprises two narrow ledges to pitch your tent and a natural cave which can serve as the kitchen. 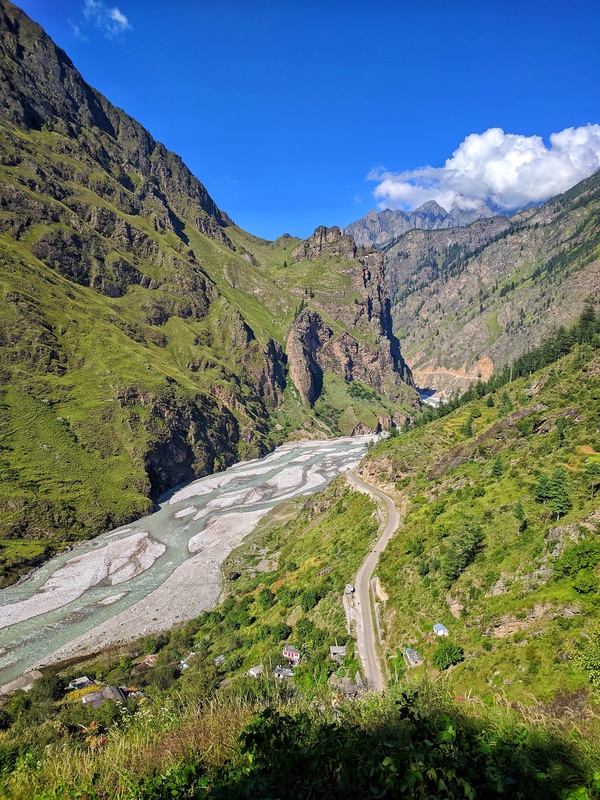 Damp, dark and claustrophobic, Bhelta has that one thing trekkers and mountain travellers cannot do without – a water source. 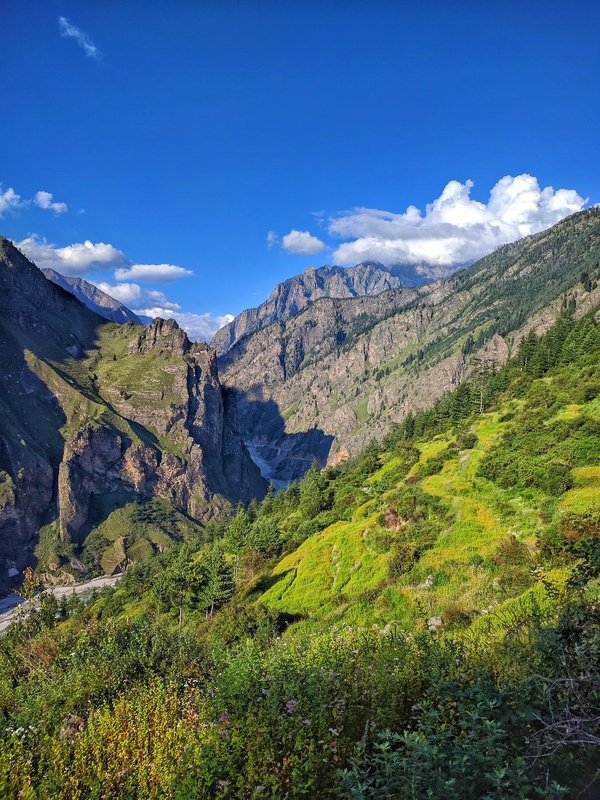 Kanook: Kanook, also called Kanook Khadak is about 400 m above the Bhelta campsite and is a small meadow with a view of the Dhauliganga valley. While this clearly does not suffer from the claustrophobia of Bhelta, it does not have a water source. Since we had started the trek late and we were short of water, we chose to camp at Bhelta. 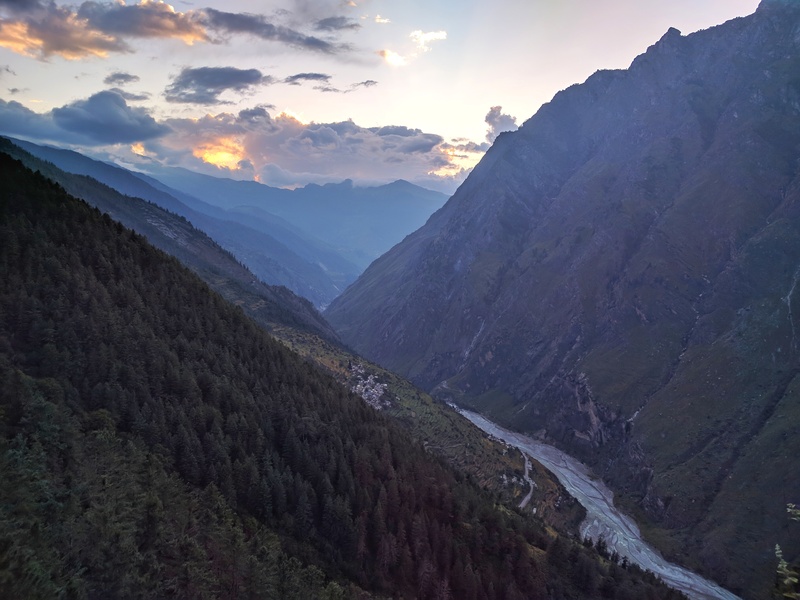 Looking back at the end of the day – on the bottom right is the Dhauligamga, to its left is the road from where we started the trek three hours ago. Slightly higher up is the village of Summer Lata. Bhelta Campsite. It was right after the monsoons and the vegetation was so overgrown that our tents and the kitchen cave were totally hidden. 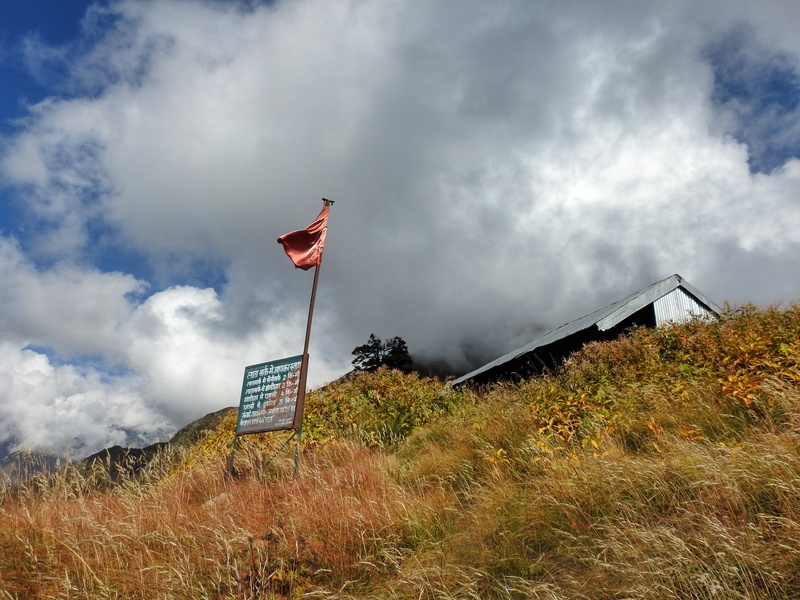 The 13 km long trek from Summer Lata to Lata Khadak can be largely divided into three section. The first part of the journey, one we had just completed, ends at the Bhelta campsite and is a gradual climb through dense forests. 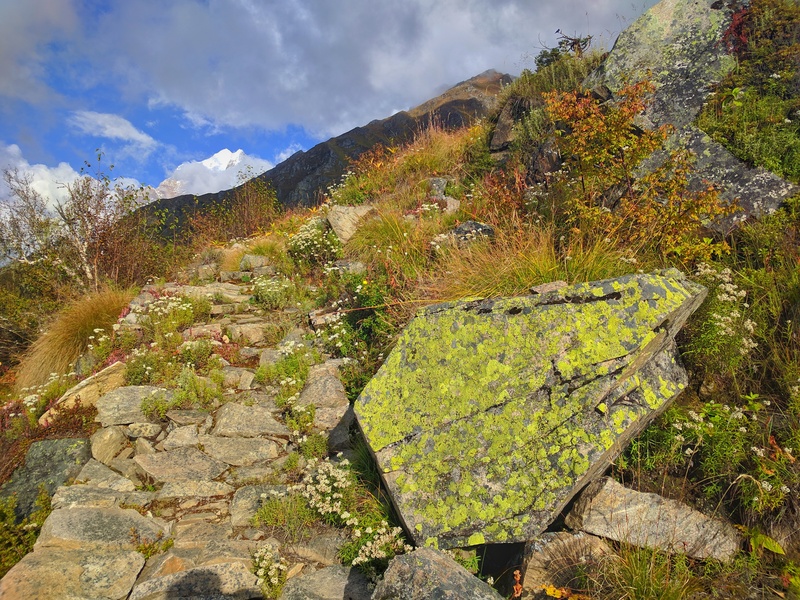 The next part of the trek is the actual steep climb that starts immediately after Bhelta and continues all the way to the treeline. The last and the third part of the trek continues steeply uphill above the treeline, all the way to the Lata Khadak log hut. In the rarified air and lacking the shade of the forest, sunburn is a real possibility here. The Nanda Devi Sanctuary in general and this trail, in particular, is off the beaten track and we were the first group attempting this trail this particular year. 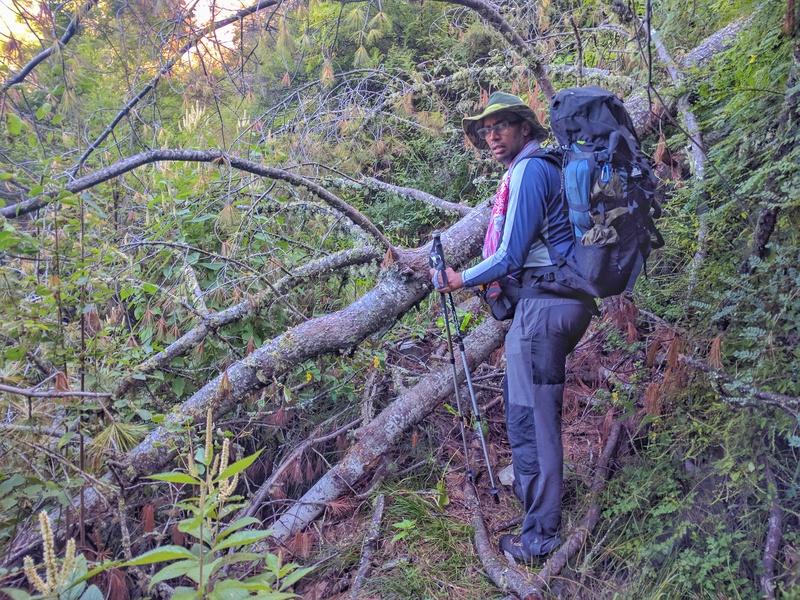 This meant that in places, the trail was swallowed up by the forest and we could rely only on the directions of our guide and at times, some clever guesswork. This was going to be a tough day for me as the climb looked almost vertical. In my mind, I had calculated that it would take me a better part of 8 hours to complete the 8 km stretch. We set off around 7:30 am from Bhelta and maintained a slow but steady pace. 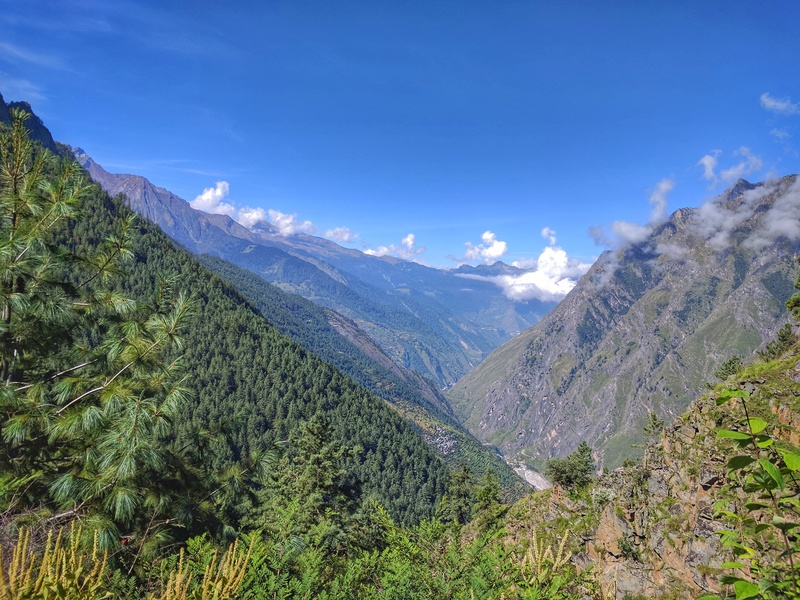 Every now and then the forest would thin out along a ledge and offer spectacular views of the Dhauliganga Valley and even the Gorson Meadows some 40 kms away, where we had camped to acclimatise ourselves to the altitude. 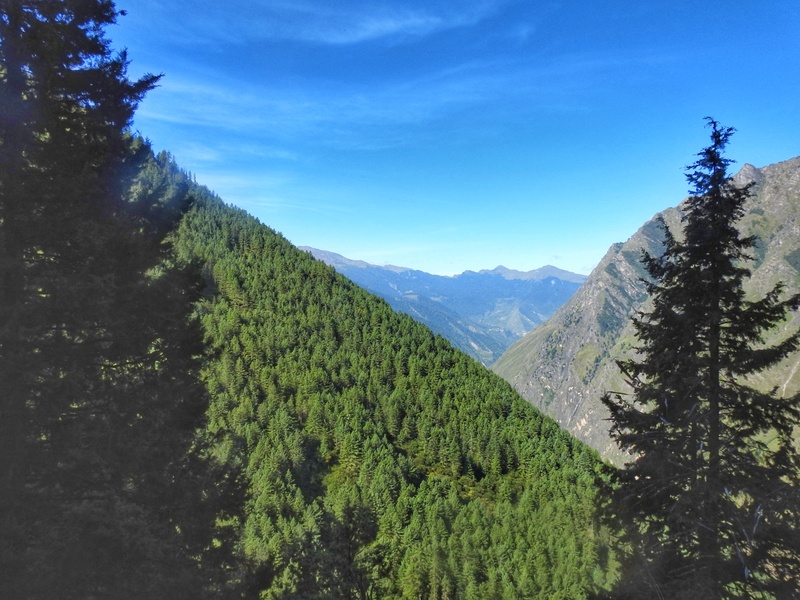 The dense pine forests of the Nanda Devi sanctuary. The top of the ridge in the background is the Gorson Meadows. Zoomed in view of the Gorson Meadows from somewhere between Bhelta and Lata Khadak. Looking down at the distant valley through the colourful tangle of the forest foliage. Lata grows increasingly smaller. The Dhauliganga is a mere ribbon. 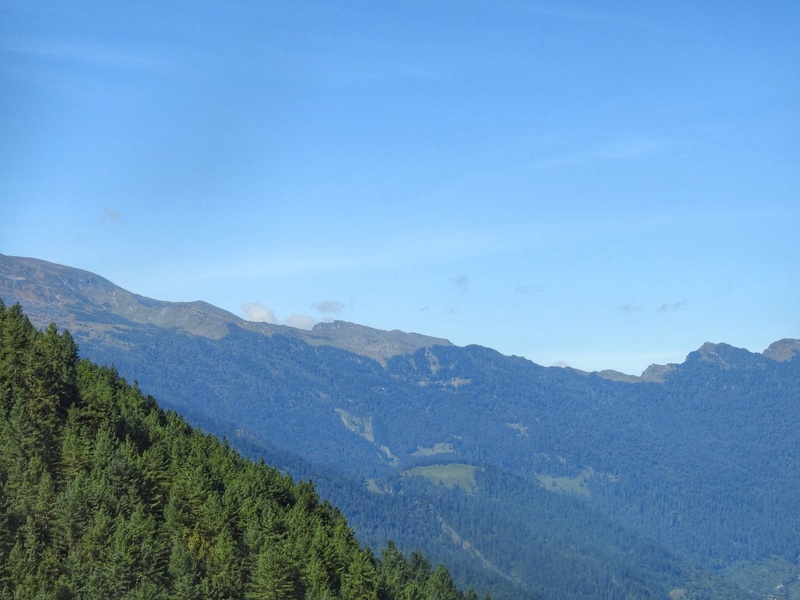 PANORAMA: Click to expand. See if you can locate Lata village. What these photos do not capture, however, is the silence of the forest. This is one of the reasons I chose to get away to the mountains. There is something pure and therapeutic about this silence. 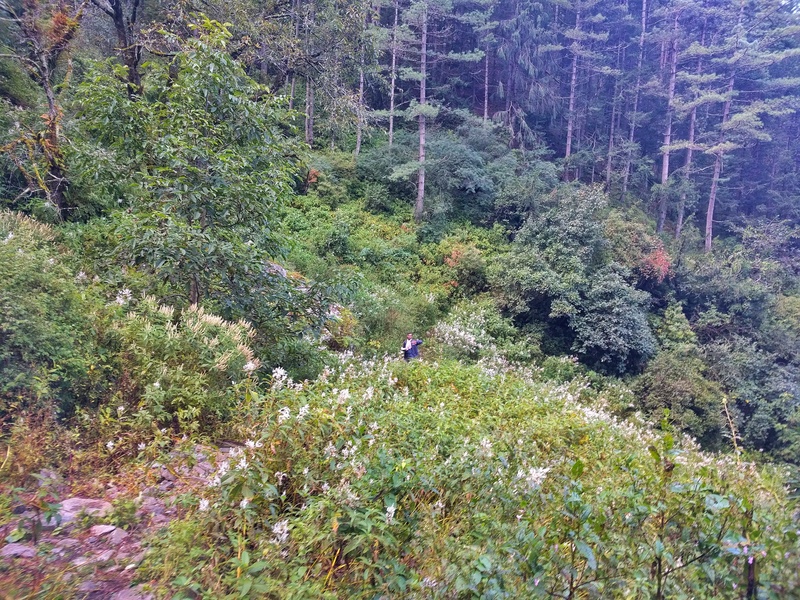 After a couple of hours of climbing through the forest, we found ourself suddenly above the treeline. The path now snaked through ankle length grass swaying merrily in the wind. This was the last stage of the trek to Lata Khadak. The trail, however, was still unforgivingly steep. At this point, our guide, irritated by my slow pace had decided to abandon me. ‘Ab toh asaan hai‘, he said. ‘Just look out for the laal jhanda (red flag)’, he said. On and on I went till a red flag mercifully revealed itself at the top of a hill. As I climbed towards it with a zombie-like intensity, a long, green, timber structure revealed itself. At last, I was in Lata Khadak (3,800 m), our destination for the day, and shelter for the next three. View of Lata Village and Dhauliganga valley from above the treeline. Out there… in the distance is a red speck of a flag. Out there is our destination for the day. At long last… the Lata Khadak cottage. Sharp edges of the mountain lit by the afternoon sun. 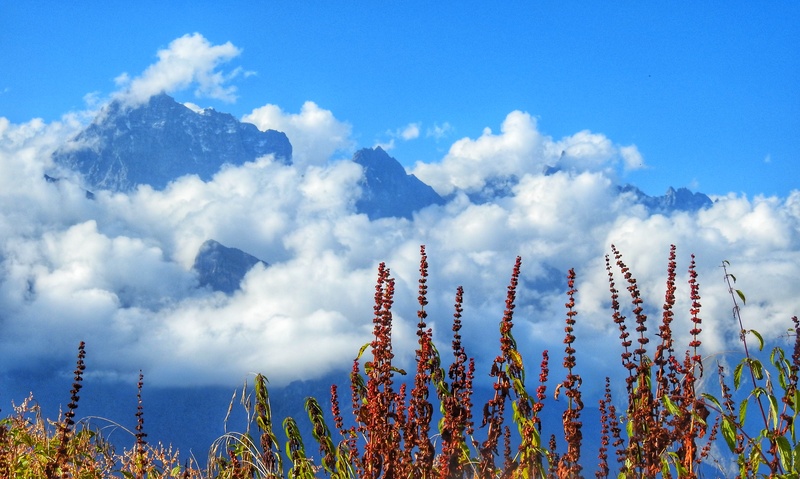 Clouds obscure the Bethartoli Himal. On the south-west side is the Dhauliganga valley from where our climb started. Further left to the Dhauliganga valley is the Rishiganga gorge followed by Ronti nala. 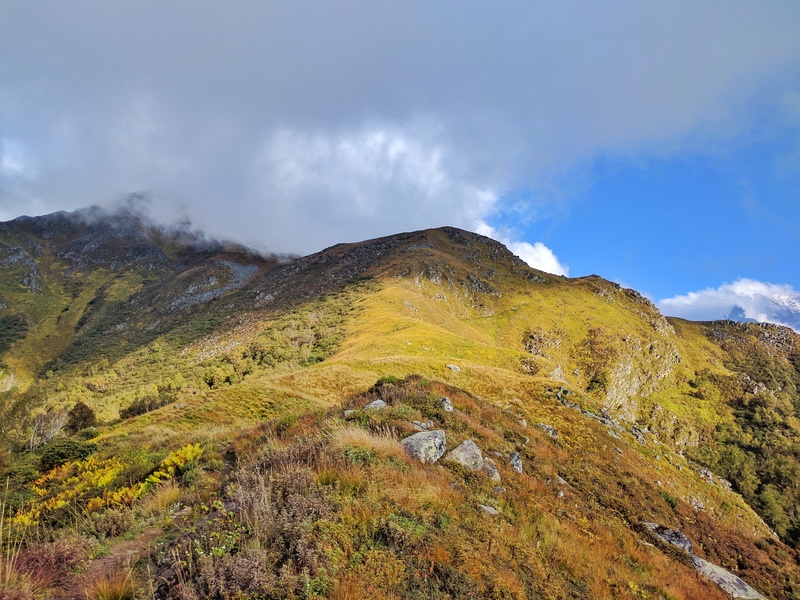 On the south side, we could see our trekking route – Gorson bugyal-Talli-Khullara-Kuari Pass and a part of descend to Dhak road head. A small ridge connects Lata Kharak with Saini Kharak and Jhandidar. 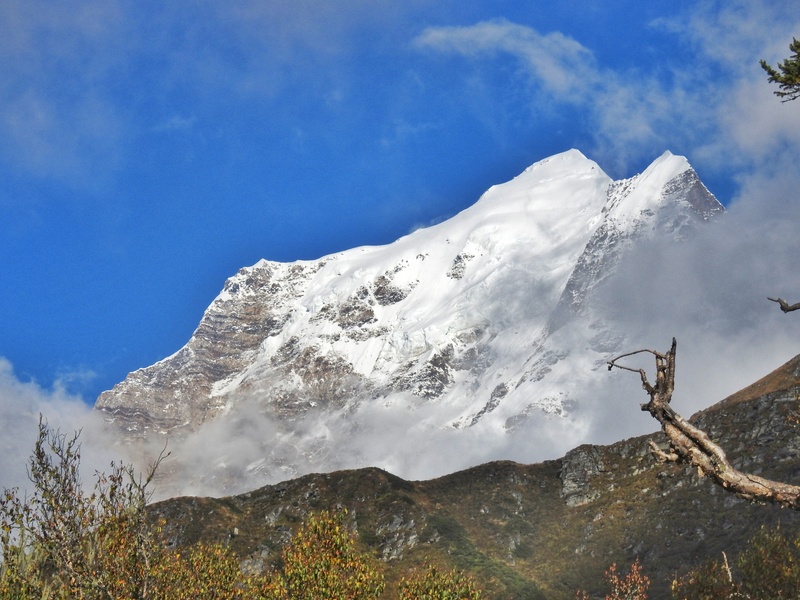 On the north-eastern side, the prominent peak visible is Dunagiri (7,066 m) and some distanced peaks on the Indo-Tibet border. 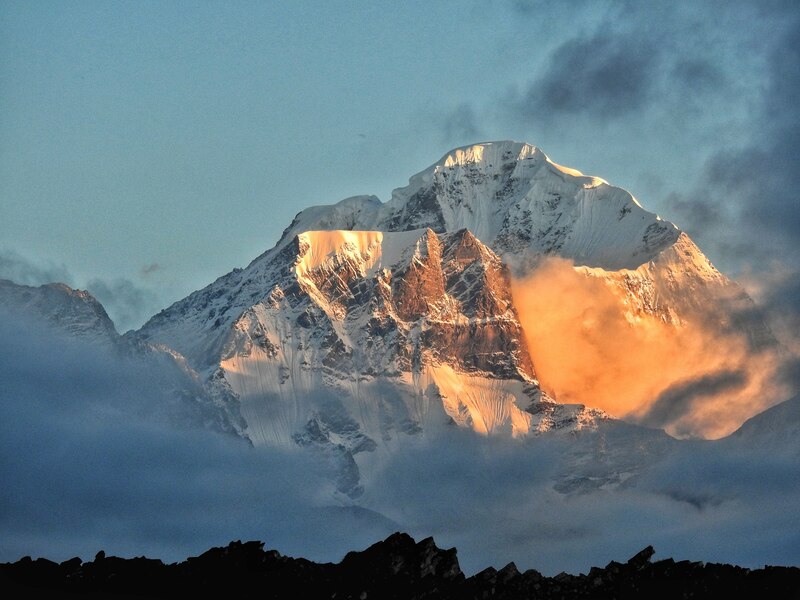 The closest peaks to see from Lata Kharak are Bethartoli Himal, Nanda Ghunti (south face), Ronti, and Hathi Parvat . Nanda Devi, Devisthan I and II peaks are not visible from Lata Kharak as their views are blocked by Jhandidar ridge. These peaks can be viewed only from Saini Kharak. 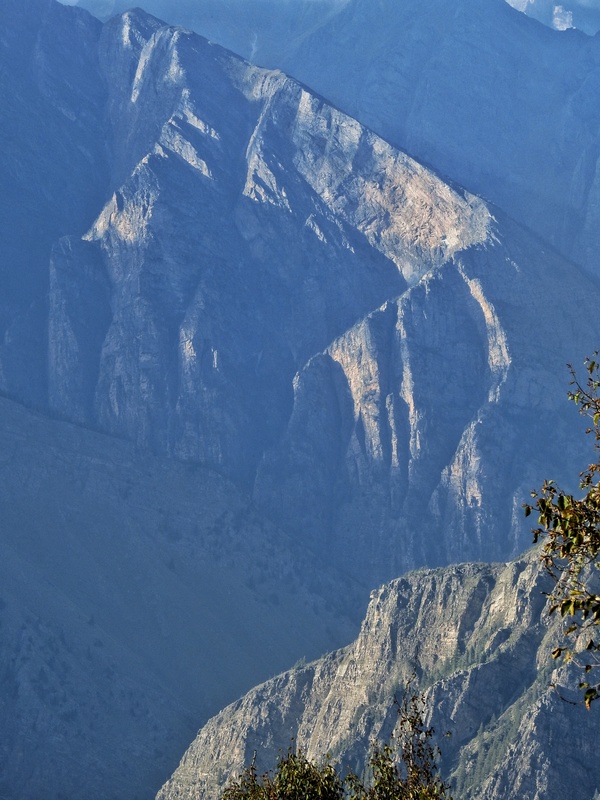 One of the best things about Lata Khadak is the stunning view of Dunagiri. When we arrived the northeast sky was covered by scattered clouds, but within about an hour, the clouds were gone and there stood the mountain, seeming almost an arm’s reach away. Dunagiri looms of Lata Khadak. Once my battered body was coaxed back to life with a gallon and a half of steaming tea, it was time to explore the immediate surroundings. Just behind the cottage a narrow pathway leads to the ridge that connects Lata Khadak with Jhandi Dhar and Saini Khadak. The late September sun was at its golden best, colouring the already spectacular surroundings in a shade of honey. Golden light on mossy rocks. Dunagiri on the left. Looking back at Lata Khadak from the ridge. Looking towards Jhandi Dhar and Saini Khadak. 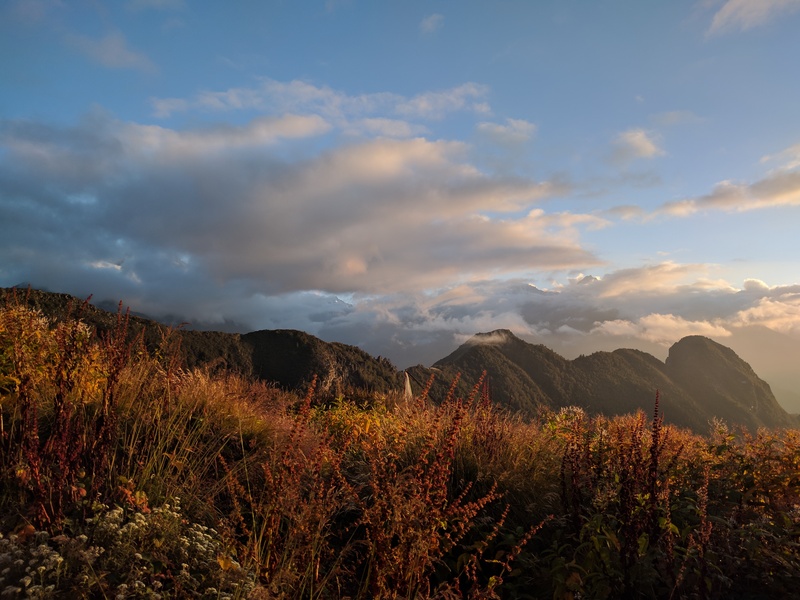 After two days of hard walking, it felt great to just sit soak up the last rays of the sun from such a spectacular spot. Not a sound was to be heard save the chirping of the crickets. In front of us lay a great big icy wall, the kind that would put the great northern wall of Westeros to shame. This formidable wall was made of mountains including Bethartoli Himal (6,352 m), Nanda Ghunti (6,309 m), Ronti (6,023 m), and Hathi Parvat (6,727 m). In my experience only mountains, and the Himalayas, in particular, can make you feel so utterly insignificant that it shakes you out of the self-centric bubble we tend to live in. This is the ultimate surrender – knowing how powerless you are against the sheer force of nature. You come back a grounded and a more rounded individual. 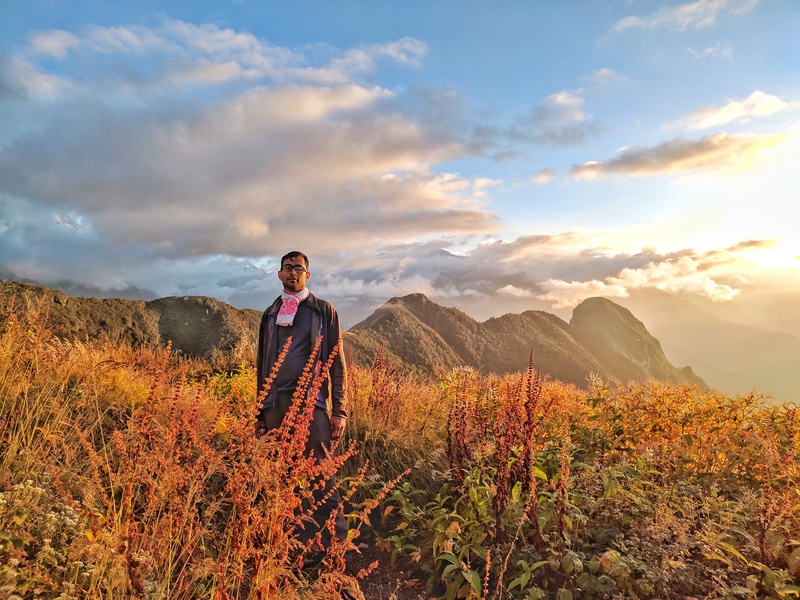 The long day, which began deep in the forests of Bhelta, was slowly coming to an end on a sunny rock overlooking some of the deepest valleys in Garhwal. The golden light had, by now reached the icy wall of Himalayan pinnacles. The stunning Bethartoli, now bathed in the yellow light resembled a mountain made of gold. The tiredness of the body was forgotten… pain in the limbs suddenly felt very inconsequential. All we could think of were the promises of the next day. 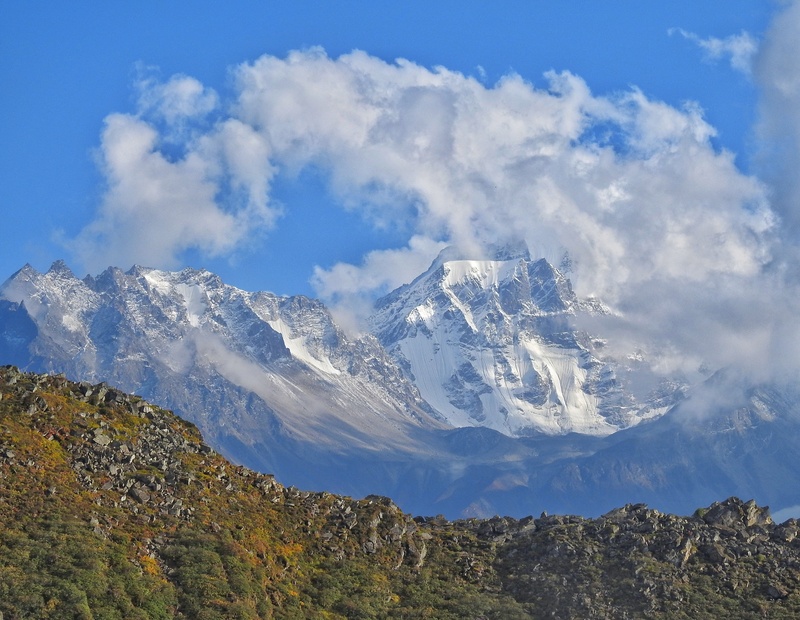 Mountain of Gold – Bethartoli Himal.